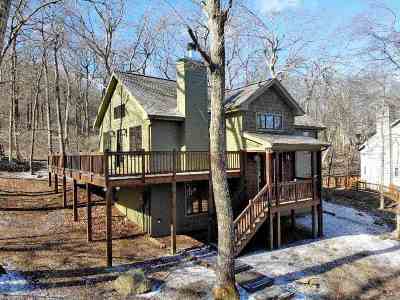 Welcome to 298 E Catoctin Dr at Wintergreen! A charming craftsman home built in 2014 and in like-new condition. Only one owner. Open floor plan, perfect to entertain friends and family. The home has 4 BRs but one of the bedrooms on the lower level is extra large and could be used as an entertainment room (current use), a 4th bedroom or a combination of a bedroom/ den. In addition to the central heat the owners added an efficient liquid propane heating systems throughout the house (electric heat pumps could be expensive and not very efficient in the cold winter weather). Property is located behind the green on hole #14 of the Devils Knob Golf Course. Go out in the evenings and practice your putting game or use the golf cart paths for walks.